Today is my mom’s birthday! 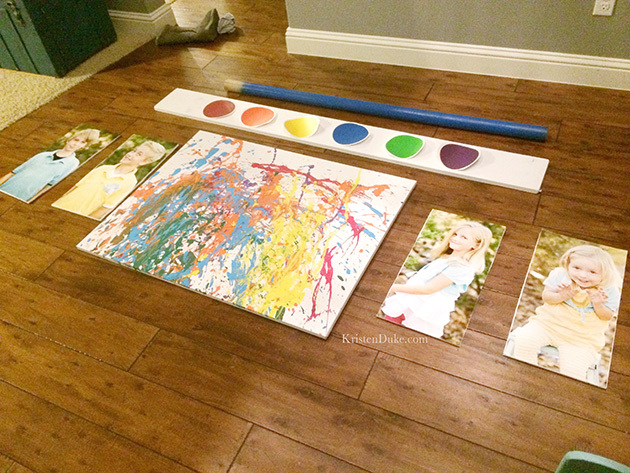 Her knick name is Rainy and she loves rainbows, so I though in honor of her, I’d post about my Pottery Barn Knock Off Giant Paint Pallet and Brush set from our Colorful Playroom Makeover. Some of you may remember that my parents are currently living in Ghana serving a full time mission for our church. Since I can’t see her in person, (and because I neglected to mail a package a month ago to get to her by today) I thought this was the next best thing. My mom is pretty crafty. She definitely taught me that I can create or build whatever my mind dreams up. She was the handy one around our home growing up, got her degree in Home Ec! She shadowed her dad in his wood shop as a young child, and learned the tricks of the trade. She gives my husband tools for Christmas and gets all giddy that he loves the power tools as much as she does. Neither myself or my brothers really picked up that passion. I’m trying to be better (see this video of me using a power saw) and braver. When I was on drill team in high school, she was the head seamstress making crazy costumes for 70+ girls on my team. Then she started a sewing business which she called Rainbow Custom Creations. So I knew she’d love this colorful room. She loves red, too. Knew she’d love this red dresser. So Happy Birthday, mom! Now to the paint set. I’d seen this floating around the internet for years, the Pottery Barn Paint Set. I’d always loved it, but never looked too closely at it. I LOVE giant things (remember my giant silverware in my kitchen?) I even considered buying it (I had a moment of weakness) but the brush is no longer available. I figured the palette part would be easy enough, but how exactly was I going to make the brush? I first tried using a bunch of yarn, but that didn’t work out so well. For the base of the paintbrush, I used a big brown tube that my husband brought home from work. I would think that wrapping paper tubes would do a similar job, two taped together. I spray painted it blue, and had silver duct tape ready to wrap. 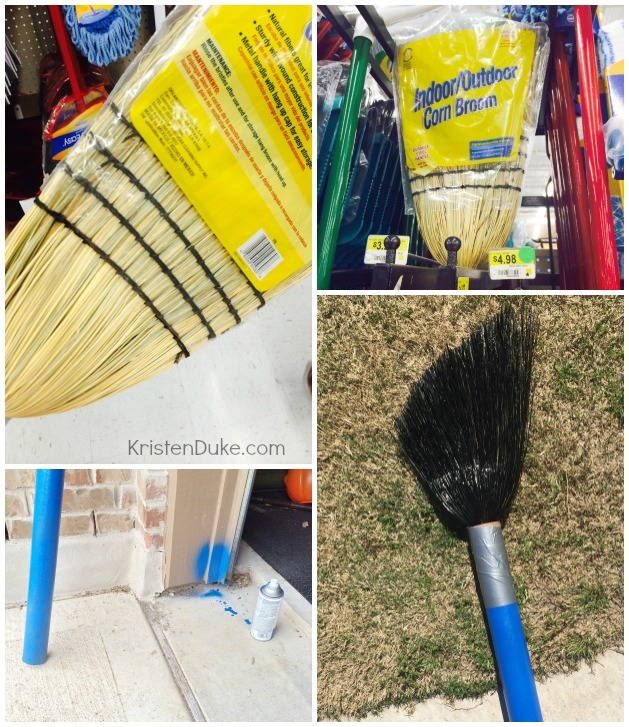 When I found my broom at Wal Mart, I snipped off the wire with wire cutters, cut the bristles at an angle, and spray painted it black! $5, not so bad! I put the handle of the broom inside my tube, and taped it all together. The bottom left image is kinda funny. I was spraying the brush outside, had to leave, closed my garage door, it came back up, closed it again as I drove away. I cam home to it open again and realized my can of spray paint was in the just the right spot to be knocked, spray the wall blue, and the door went back up. I just can’t get over how funny that was! 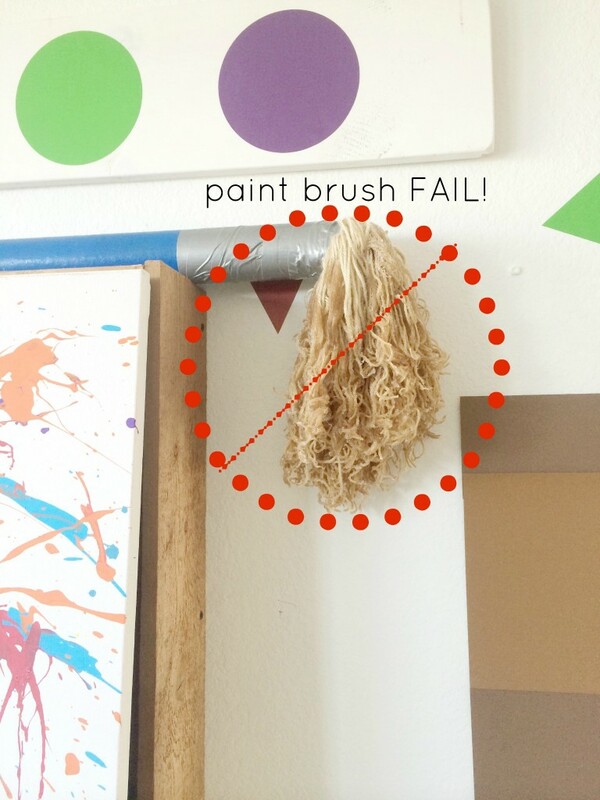 Another funny story about this paint brush is that I changed my plan to make this just a few hours before my post was to go live, which was time sensitive, being the last post to wrap up the 2014 Decorating with Pictures series. I planned to use the other one, but I just happened to drive all over town that morning just to check and see if I could find an old school broom that would work. When I did, I debated as to whether or not I could pull it off (make it, then re take the room pictures). My post was 30 minutes late, but I did it. I veered a different direction from the Pottery Barn original, I wanted just the 6 rainbow colors, and I wanted them centered on the pallete. I used vinyl circles cut from the Fussy Mussy Designs shop by my friend Staci. I borrowed the pictures from the Repurposed Frame Tutorial to lay it all out, as my other prints were on order. Laying it out really helps me visualize how the pieces will all hang together. I planned to rest the paint brush on a few hooks or nails sticking out of the wall, but I decided to rest it on top of the canvas. Play it by ear, right? Overall, I’m really happy with how the paint set turned out! My kids think it is pretty fabulous too, and I love that! 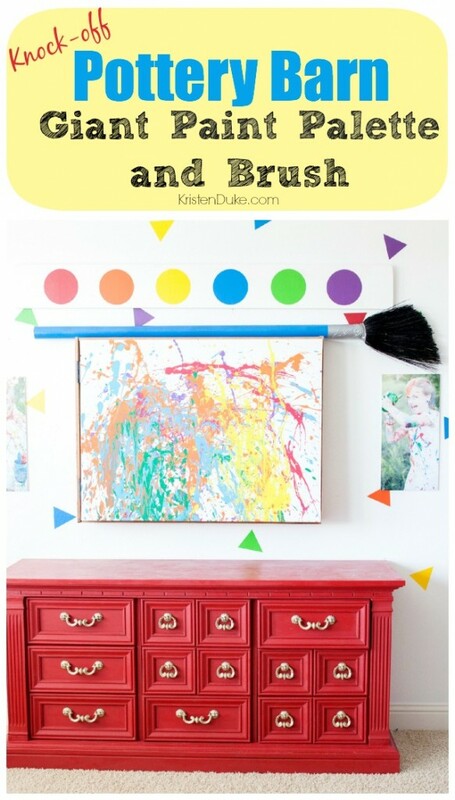 It adds an element of fun to a kids room, maybe inspires a little creativity, too.